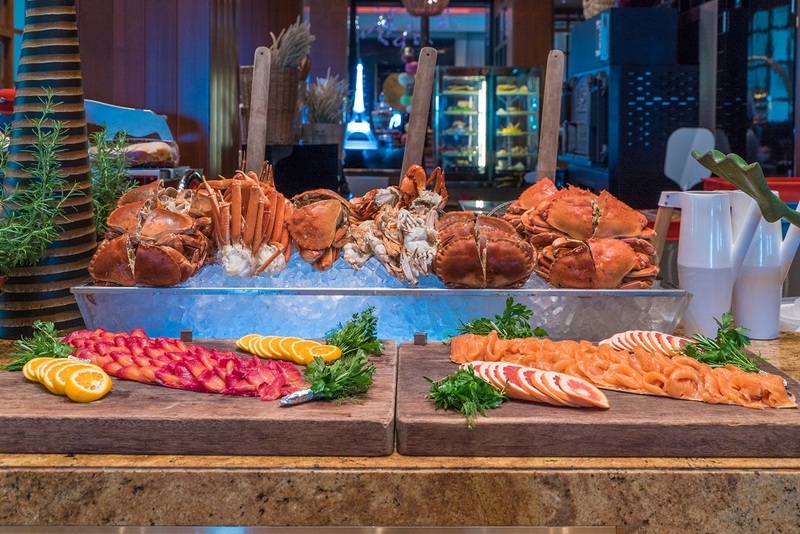 Whether you’re looking for all the seafood on ice you can eat, grilled meats fresh off the barbecue or an endless array of cheese and crackers, these Sunday brunch buffet spots have you covered. These buffets crank out an obscene amount of food that often fill up multiple sections of the restaurant floor so put on your best stretchy pants – it's time to stuff your gut with everything the table has to offer. If it's variety you're looking for then Kwee Zeen is the answer. 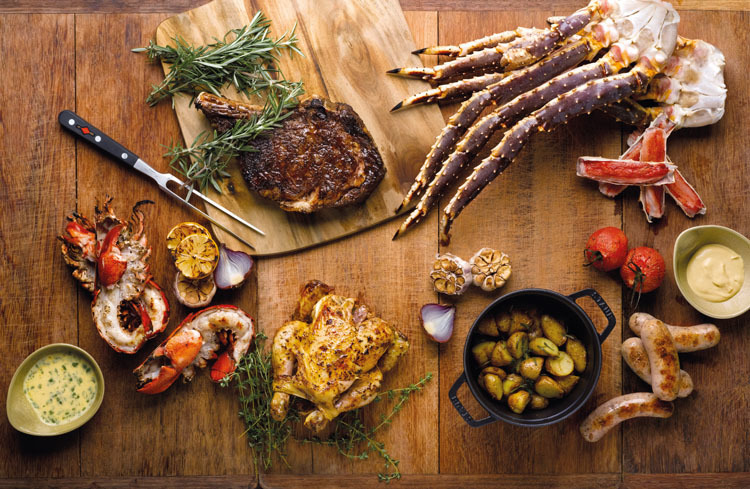 The spread goes beyond what the eye can see starting from live seafood (sustainably sourced, of course), foie gras served à la minute, a barbecue station, carvery and desserts. We guarantee that even the most seasoned buffet conqueror won't be able to try everything this Sunday brunch spot has to offer. 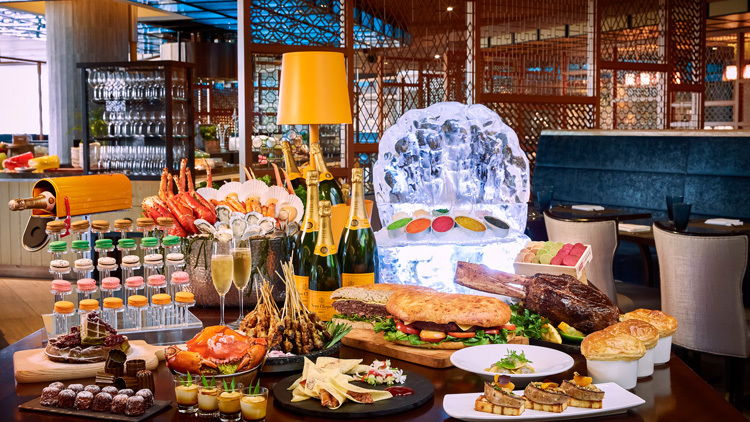 The buffet starts from $138 per adult, but top up an additional $30 and be spoilt with free-flow of Taittinger bubbly and fine wines. Compared to other hotel buffets, Basilico focuses on delivering a premier Italian experience (from $102) that you’ll be proud to bring a nonna to. From the minute you step in, you’ll be greeted by a variety of cheeses including a huge Zizzona di Battipaglia, which is traditionally used to celebrate special occasions. 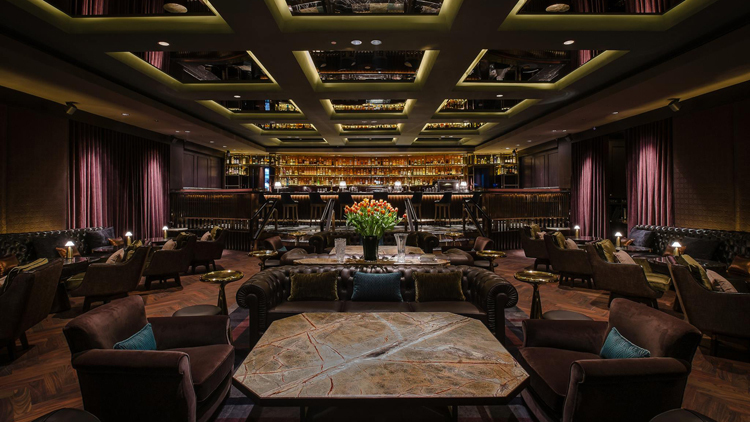 And brunch at Basilico is certainly special: there’s roasted wagyu beef rump and Amarone wine-braised crispy roast pork belly at the carving station, Sardinian malloreddus pasta with sea urchin, and pizzas that fly out from the oven every 15 minutes. The four-cheese pizza, while simple, is a dish we couldn’t get enough of – so fair warning: once you start, you’ll be spending lots of precious stomach space on carbs. 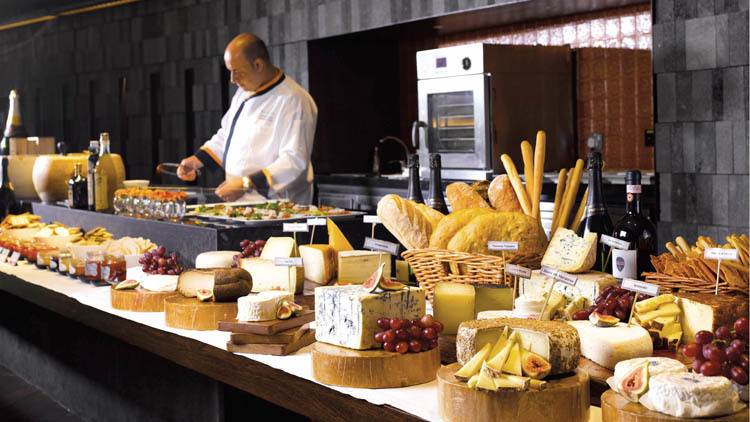 Just when you think you’ve covered most of the buffet spread, there’s an entire cheese room waiting to be explored. 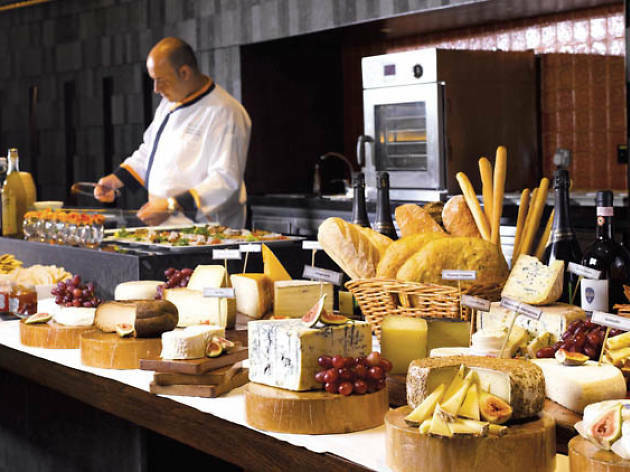 Here, the restaurant stores more than 40 regional farm cheeses from the many provinces of Italy. There’s a sharp, 40-month-aged red cow Parmigiano, applewood-smoked caciocavallo and, for the adventurous, a Barolo wine-infused pecorino. You’ll also find a chef stirring black truffle risotto with stracchino cheese – that’s more carbs you’ll love stuffing your face with. 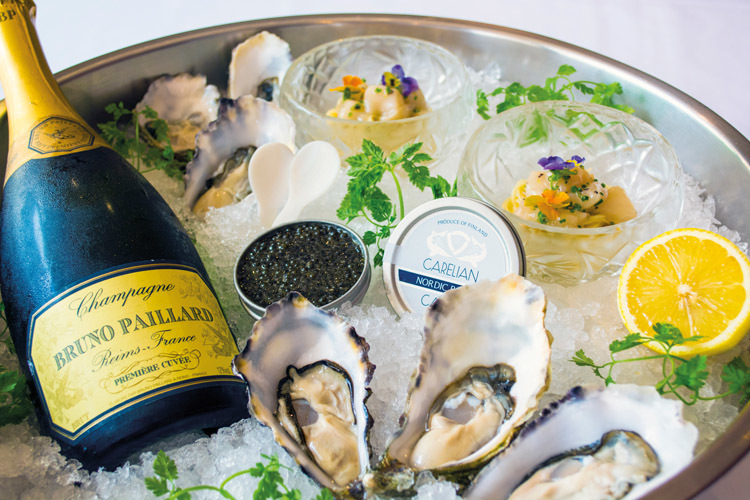 Here’s a champagne brunch with an emphasis on the booze. 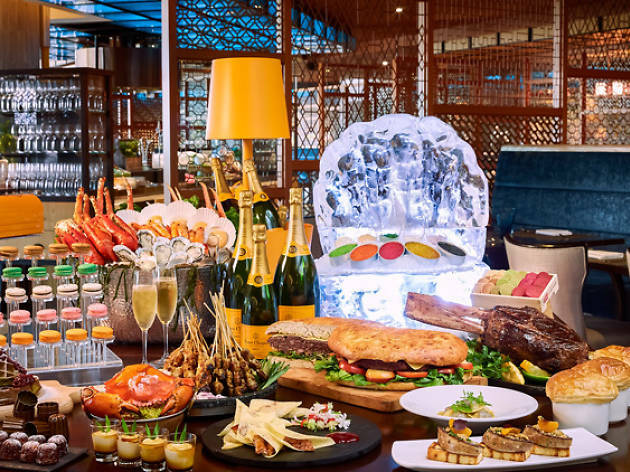 The regular buffet is priced at $128 per person but for just 20 bucks more, you’ll be able to enjoy free flow Perrier-Jouët Grand Brut Champagne, house red and white wine, beer, mojitos, Bloody Marys and margaritas. It’d be a crime not to shell out for this. There’s also a machine that pours out freshly squeezed orange juice on-site, so stir in a little bubbly and – voila! – you’ll have your very own ‘housemade’ mimosa. The food stations at Mezza9 are as intoxicating. You have your cold seafood one, whose Maine lobsters, brown crabs and Spencer Gulf wild king prawns are all sustainably sourced. And a new Thai grill, which replaces a Japanese yakitori counter, spreads out barbecued chicken thigh and sausages that’ll remind you of the streets of Bangkok. While the dessert section is admittedly modest compared to the others on this list, there are still treats like pastries and a chocolate fountain to keep your sweet tooth happy. The liquid nitrogen meringues are worth queuing up for – it’s that much fun. The flavours of the whipped dessert change every week, but the novelty of popping one into your mouth and breathing out vapour doesn’t. Perfect for taking a Boomerang that’ll make your friends jealous. 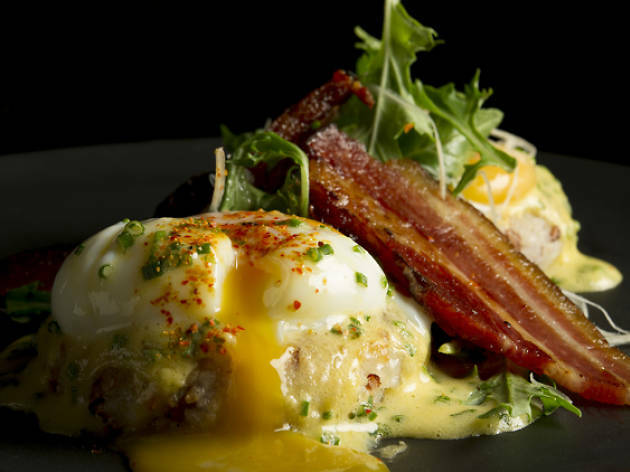 You won’t find any stale, lukewarm food at Edge’s Theatrical Sunday Champagne Brunch (from $118). There are seven live food theatres where chefs prepare dishes à la minute, ensuring that everything you pile on your plate is piping hot. And you might want to skip dinner the night before to make room for this. The buffet goes on for 4 hours to allow you the time to sample everything. 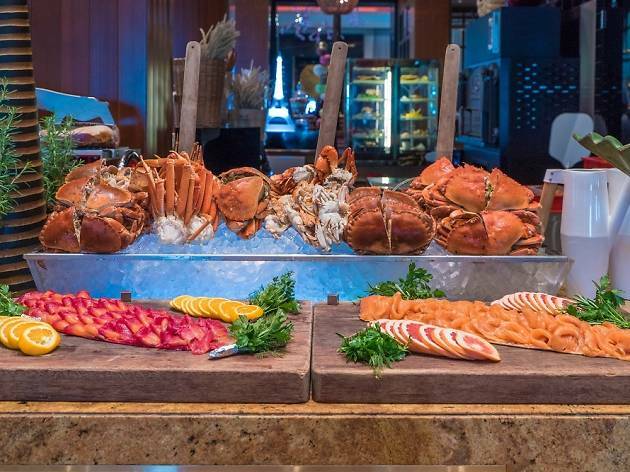 The 16 food stations include a cold seafood counter where you’ll find sweet and fleshy Alaskan king crabs, Maine lobsters, oysters and a bounty of sashimi. 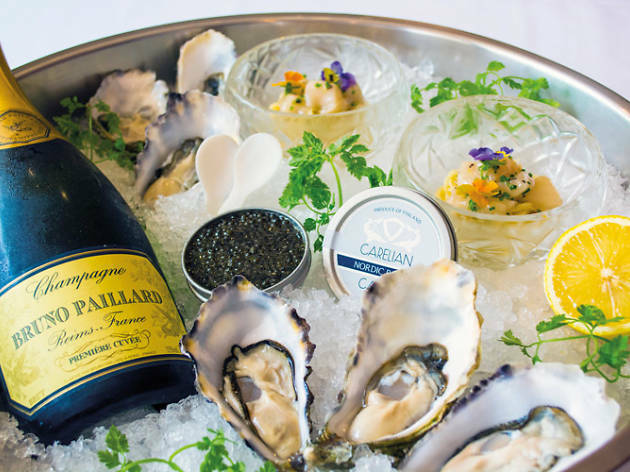 A range of caviar, such as ikura, can also be spooned from the Raw and Caviar Bar. Meat lovers should rock up to the grill for juicy sausages and, the pearl of the savoury section, unctuous Ohmi wagyu striploin. Thank goodness there’s always space for dessert, because the selection at Edge is the real kicker. From waffles, pancakes and crêpes all made before your eyes to traditional desserts like durian pengat and kueh lapis, it’s hard to try them all. Make a beeline for the nama chocolates – these nuggets of pure bliss are even better than those from Royce. Yeah, we didn’t even think that was possible. 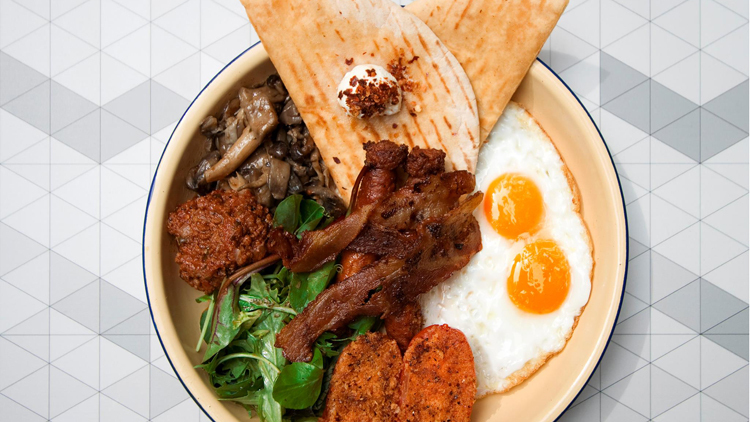 If your Sundays are more for recovering from a heady night out, Kinki’s Saturday bottomless brunch ($52) is where it’s at. Japanese is the name of the game here, and Kinki mixes up traditional fare with a modern touch: the Hot Dynamite, for example, is a maki of fried salmon, yellowtail, scallions and cayenne pepper. While not as spicy as its name suggests, it’s a pretty good way to kick off your brunch. 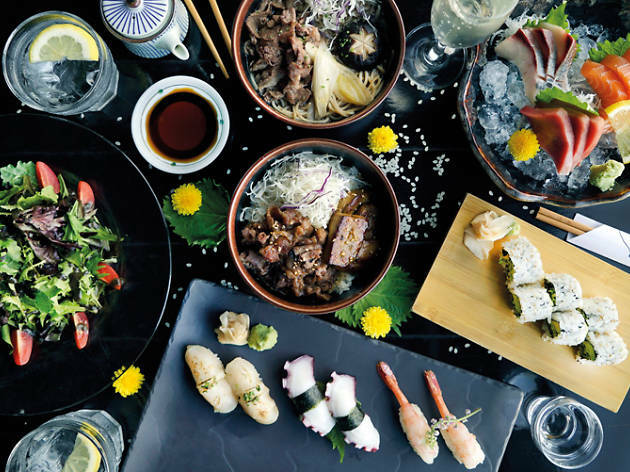 And fans of the rooftop bar’s wagyu foie gras donburi will be pleased to know that the bowl of thinly sliced beef and pan-seared goose liver over Japanese rice is available at this buffet – along with 43 other dishes from the regular à la carte menu. 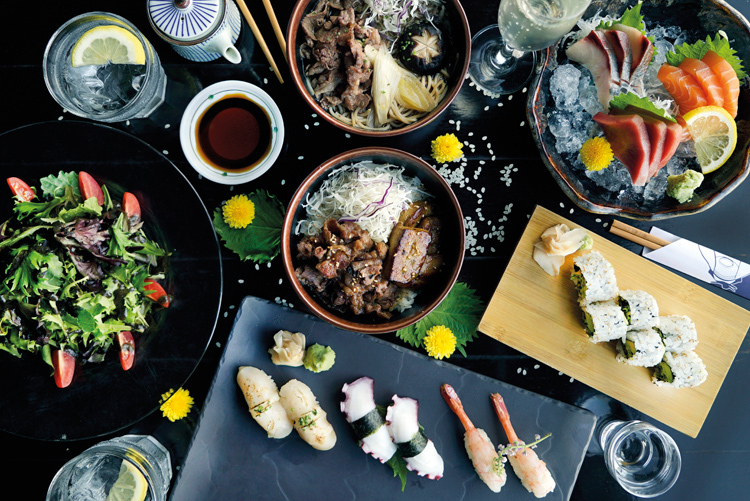 Aside from the free flow section of sushi, maki, sashimi, rice bowls, sides and desserts, opt to have an endless amount of sake, shochu or prosecco at an additional $35 per type of liquor, or beer (Carlsberg, Asahi Super Dry and Kronenbourg 1664) for $25. Our pick goes to the Echigotsurukame Shofukujin Junmai, whose umami notes pair well with the food. Don’t feel like day drinking? There’s soft drinks for a top-up of $5. "Craft cocktails" and "free-flow" are usually contradictory concepts but not at Manhattan. 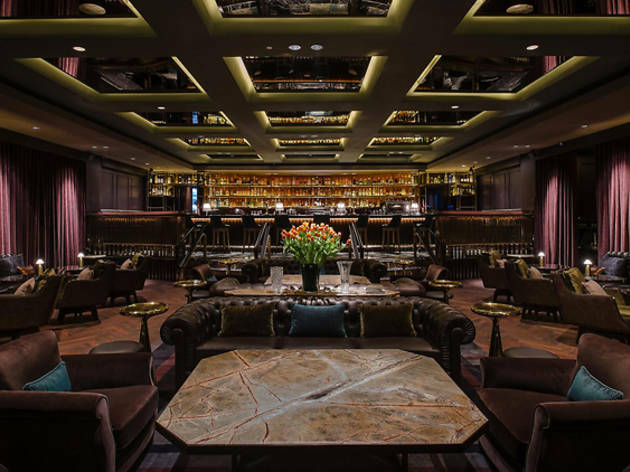 After all, the swanky bar reigns supreme on Asia's 50 Best Bars 2017 list. On Sundays, $150 nets you all the cocktails you want (well, wines and beers too) and free play in the Bloody Mary room that's decked out with a mind-boggling array of condiments from crudites and bak kwa, to pickles and hot sauces. The cocktails at brunch differ from the usual bar menu; they’re generally on the refreshing end of the spectrum (think seasonal bellinis, fizzes and sours), but that’s quite brunch-appropriate. The buffet spread reflects the bar's American identity, down to the deli counter with freshly made bagels, cream cheese schmears and American cheeses. Among the highlights: shrimp cocktails and Maine lobsters, latkes with caviar, glazed cronuts and banana cream pie. And because it’s Manhattan, there's also negroni creme brulee and margarita dome. 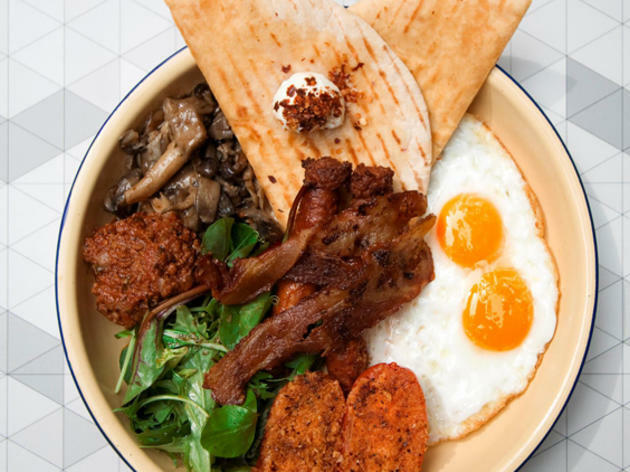 Quality trumps quantity at this celebrity chef restaurant – which makes its brunch buffet ($88, add $70 for free flow alcoholic and non-alcoholic beverages) perfect for those not endowed with elephantine appetites. A table of cheeses, bread, pastries, seafood, salad and fruits is all-you-can-eat, but each diner can only pick one main and one dessert. Delicate eating seems to be par for the course here: our prawns and crab legs come shelled, making this one of the only buffets where we didn’t have to eat anything with our fingers. 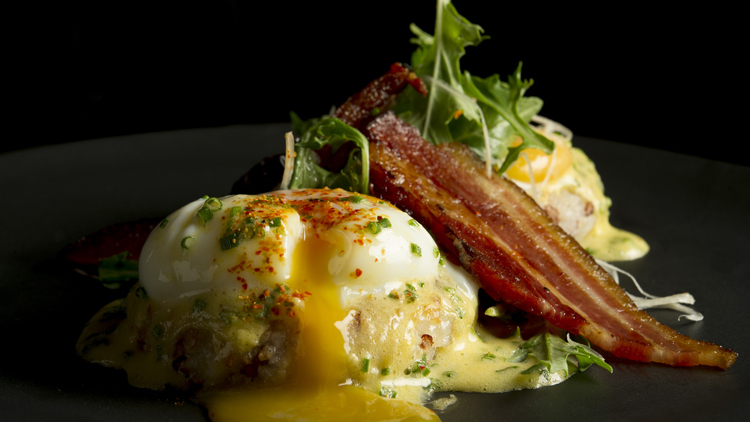 For the mains, go for Adrift’s signature eggs Benedict, an onsen egg and bacon atop grilled rice cakes. Served with miso hollandaise, this Asian twist on the American classic was something we didn’t expect from the Bostonborn chef. Dessert-wise, order the crêpe soufflé. Imagine a fluffy hotcake topped with a touch of pepper and some mangoes – it’s a delight after a heavy meal. 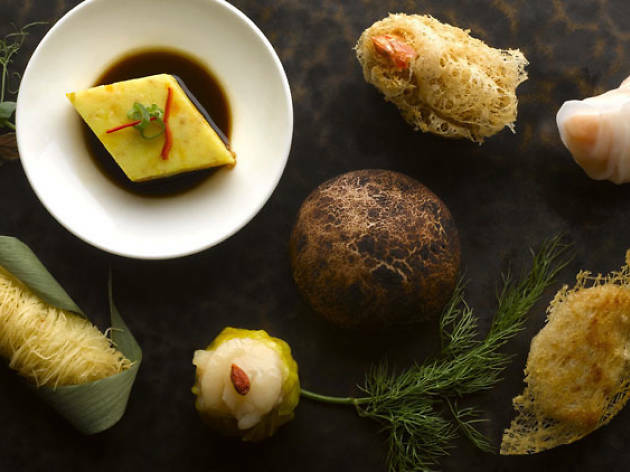 If you’re looking forward to Yan Ting’s weekend dim sum buffet brunch (from $108), steer yourself towards its mains. 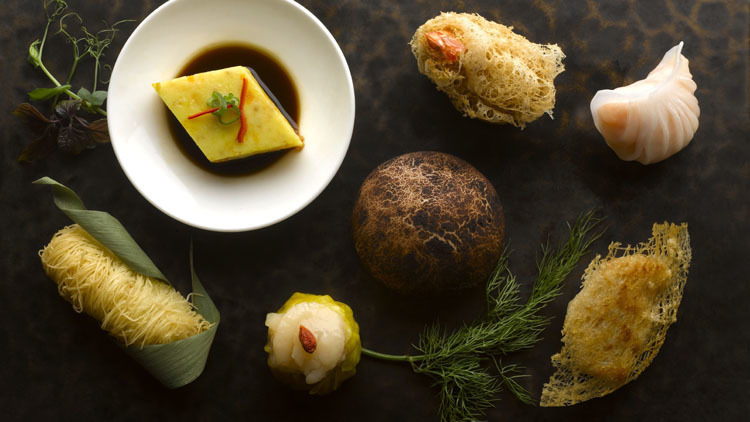 Because despite its name, the paltry selection of dim sum is subpar as a whole: the too-thick skins of its scallop and spinach dumplings result in a starchy experience, and the char siew bao fares no better. Instead, go for the oven-baked barbecued pork pastry and egg tarts, each flaky and buttery in its own right, as well as the century egg congee – it’s thick with strong, meaty flavours. The light and crisp batter on our fried soon hock is dreamily addictive and snaps almost like crackling, while the sweet and sour pork has a thicker batter that stays crisp despite being cloaked in sauce. Too bad the wok-baked Boston lobster is limited to one serving per person – its sweet, plump insides are cooked in thick broth to a chewy consistency, and made us yearn for more. And the seafood, stir-fries, meats and vegetables are fresh and made-to-order, too. For all it’s worth, where Yan Ting fails on the dim sum front, it checks all the right boxes with its service and big plates. Garibaldi is arguably one of the best Italian restaurants in Singapore, serving dishes created with ingredients flown in from the homeland. And it’s no different for its weekend brunch: the menu ($88 with free flow soft drinks, add $30 for free flow prosecco, beer and house wines) varies weekly depending on what chef Roberto Galetti manages to procure. Don’t expect a high-octane, shove-your-way-to-the-spread vibe. You’re meant to kick back and wait as dishes from the weekly set menu roll out to your table. You can order more servings, but you won’t need to unless your appetite roars like the San Siro. Garibaldi puts out stunning dishes from the get-go, starting with the mousse-like Burratina cheese from Puglia, served alongside the juiciest and sweetest San Marzano tomatoes, as well as poached egg with cheese fondue and shaved truffle. Six starters are served, but pace yourself. The mains are – surprise, surprise – heavy on the carbs (three pastas) and proteins (two meats). The rigatoni, with fork-tender beef ragout in red wine sauce, is the best of the pasta trio. But the star here is the tagliata. Typically an Italian-style steak, the Garibaldi version uses juicy Kurobuta pork, slightly charred and served with a mushroom ragout. By this point, you’d be praying for sweet reprieve. And you’ll get it, quite literally, in the desserts – they arrive as four bite-sized pieces, arrayed on a long plate. The standout: an earthy coffee panna cotta whose creamy texture is right on point. In fact, everything is. Salted & Hung's brunch buffet menu ($58, available on Saturdays and Sundays) numbers just 13 items excluding the charcuterie counter. But that's 13 faultless dishes and all are generously sized. 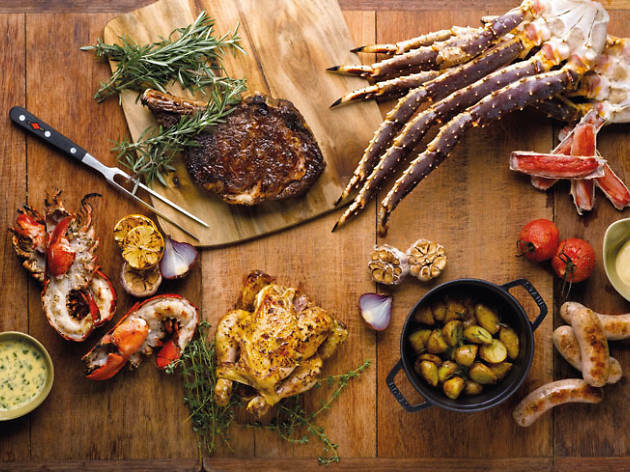 Aussie chef Drew Nocente’s food is inventive yet familiar, and very ingredient-driven. The Freemantle octopus is sublime for a texture that's both chewy - like octopus should be - and yielding. A smoked halibut crostini, crowned with caviar, retains the natural sweetness and clean flavours of halibut but also carries the smoky nuances signature to the restaurant. The handmade pasta and wagyu ragu is elevated by incredibly moreish beef fat crumbs. We suggest sitting at the counter: to kaypoh and also because spying other tables' food is the easiest way to keep your appetite whet.